What do we mean by rapid authoring? Well, it is essentially (just as it sounds) a tool that enables you to develop an engaging and appealing eLearning course, from start to finish, quickly and easily, without requiring you to build everything from the ground up. When selecting a rapid authoring eLearning tool, there is certainly a huge amount of choice in the marketplace today. But by no means are all of these tools alike, and it very much depends on what you want to get out of the tool as to which one you choose. It’s important to make a choice that is future-proof, so for example choosing a tool that is HTML5-based first and only rather than Flash-based with HTML5 support, will stand the test of time. You also want something that allows your development team to be creative and as they become more proficient in the tool to do more for themselves, rather than be restricted by rigid templates that don’t allow them to explore their own creativity. In addition, wouldn’t it be invaluable to have a rapid authoring tool that allows you to convert legacy training content easily? 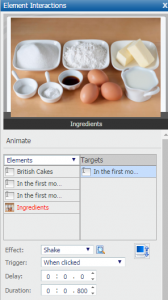 If you have existing training course material in PowerPoint, for example, it would be great to be able to import these directly into your authoring tool so it becomes track able in your LMS and mirrors the look and feel of your new material. We’ve been using a rapid authoring tool now known as dominKnow | ONE for the past five years that ticks all of these boxes, and more. This blog will demonstrate in a series of screenshots and commentary how quickly and easily you can create a new course using dominKnow's Claro. The look and feel of dominKnow Claro uses the familiar ribbon toolbar design, licensed from Microsoft, so if you’re used to using any of the Microsoft applications you will be familiar with the ribbon and how typical functions behave. 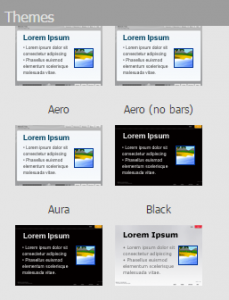 Claro provides you with numerous Themes, which govern the style, colours, etc. of your course content (working in much the same way as style sheets if you’re familiar with web design), which means you can get started with rapid authoring straight away. You can select one of the available Themes and then start to create your individual course pages. 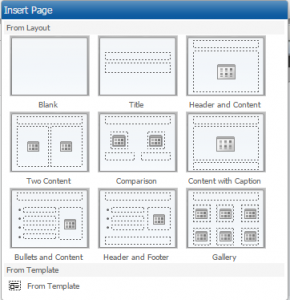 To create a new page within your course you have two options – create your own simple structure into which you insert specific page elements, or use one of the pre-created Templates which provide a predefined page for a specific task. Creating your own simple structure is very similar to how a master slide is created in PowerPoint - you choose your page layout, creating placeholders for different types of content. 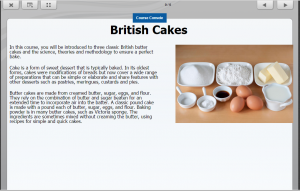 For the purposes of rapid authoring you will probably want to use existing Templates to create your course pages. 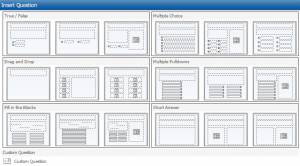 There are numerous templates available as standard within dominKnow Claro, including process flows, interactive tabs and even animated dialogues. The Template Library is continuously being updated and added to by dominKnow, and as a cloud-based solution you don’t need to install updates to get the latest releases, these are automatically available to you. You can even create your own Templates! When you have chosen your Template, Claro will take you through the Template Wizard to customise the elements of the Template to suit your specific page. All of the Templates are fully editable and can be edited by hand by accessing individual page elements, so you’re not restricted in any way. When creating a page using a simple structure, there are placeholders on the page to choose whether you want to add an image, a video, etc. and you simply click on which you want and select from your library (in the case of image or media). 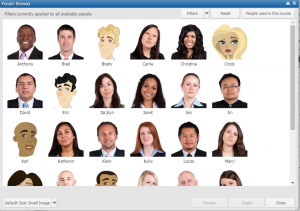 There’s a multitude of stock art available in dominKnow Claro, including People and Clipart, and these are accessible when you are creating or using your Templates as well as customising individual pages yourself. As with the Templates, these images are continually being updated and added to. When you insert a video into a page in Claro all of the media controls are already available. You can choose to hide these controls, set up the video to autoplay and loop, etc. 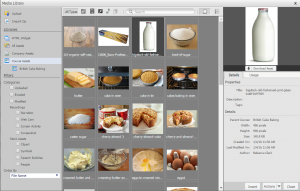 It is also very easy to swap in and out any objects if you need to when editing your course in the future. 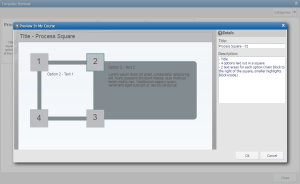 When creating a course in dominKnow Claro, any object on the screen can interact with any other. For example, when you click on one object an action is triggered or it affects another object. The ease at which you can set up these interactions is perfect for rapid authoring. Interactions can be achieved very easily using the functions within Claro’s interaction ribbon, without any coding. Simply select your object, then the interaction ribbon will provide you with all of options available for that object. For example, if you are playing a video and want a message to appear at a certain point, you can easily set that up. You could have a waterfall effect so that when one things happens, that then triggers something else and so on. It is very simple and intuitive to set up. Rapid authoring should not restrict the sophistication of your eLearning course and with dominKnow Claro you can include a multitude of different tests and assessments. When you test your learner, you can associate tests with individual learning objects. Learning objects can also be shared across multiple courses. Practice (knowledge checks) or test questions (scored) also have predefined layouts to enable you to set them up very quickly. Setting up a basic true/false question can be achieved within minutes. You can also incorporate feedback that will appear to the Learner for correct and incorrect answers. You can very easily preview each page to see what it will look like to the learner as you are developing your eLearning course. You can also preview the full course in your browser or even preview it on a mobile device. dominKnow Claro can publish your completed eLearning courses as SCORM or xAPI compliant packages. They can also be published to run directly from a webserver or for upload to the SCORM Cloud. Claro can also publish out course content for use as job aids. Portions of an eLearning course can be published as a web app, for example, and installed on a server or Share Point site. The Document option also allows you to get a print out of the course structure and assets. What else does Claro have to offer? The rapid authoring and easy to use functionality within dominKnow Claro lends itself well for use when storyboarding during the initial design of your course. For example, if a subject matter expert wants a course created but they aren’t an Instructional Designer, they could create the course skeleton easily then pass it on to an experienced developer to enhance and complete. You can use Claro to quickly convert your ideas into courses – you don’t have to manually create anything, there are templates for everything. As you get to know the tool you may want to create elements or entire courses from scratch, and you can do this too - without restriction. A Lead Developer might want to take elements of existing courses and create templates out of them. This is also easily achieved in dominKnow Claro, with the right permissions, by copying the appropriate page from the course into the Template Library. The Developer can then make that Template available to other Authors by publishing it out to a public folder. An easy way to switch existing PowerPoint slides into effective eLearning content is to access dominKnow Claro, create a new course and import your PowerPoint slide deck in one click. Each slide within the PowerPoint becomes a page within Claro itself – pulling in all of your existing text and images. You can add to and refine the content from Claro or the course can simply be published and uploaded to your LMS to become fully trackable. It’s that simple! dominKnow's Claro enables you to create professional, engaging eLearning courses very quickly – an Author can create a template-driven Claro course as quickly as you would using a traditional tool such as PowerPoint. However, the benefits to rapid authoring don’t end there. The collaborative functionality of this cloud-based tool enable your entire development team to become much more efficient. Claro provides the ability for your development team to work on the same project at the same time, solving the bottle-neck of single-user development. The use of themes and templates ensures design consistency throughout the team and learning resources can be shared and re-used across all projects. Not only do authors save huge amounts of time by using and sharing elements that already exist, they benefit in the future too should that object have to be changed, as all instances are updated in one simple step. I will talk more about the collaborative benefits of dominKnow | ONE in my next blog. Claro supports rapid authoring with its numerous quick-start features including the one-click PowerPoint conversion and hundreds of fully editable, interactive templates, but it doesn’t compromise on features or flexibility. Its ease-of-use and simplicity doesn’t equate to lack of depth. Authors are not restricted by rigid templates and can design courses from scratch if they chose to do so, or tweak and customise the templates for their specific purpose in order to create engaging, media rich learning experiences with interactions, animation, video, advanced variables, branching, and so much more. Further benefits of dominKnow | ONE include responsive eLearning design and web-based collaboration for eLearning development teams..
You can also find out more about the dominKnow | ONE and our dominKnow services on our website.